In October, the American Journal of Epidemiology published the first prospective study examining the correlation between regular NSAID (nonsteroidal anti-inflammatory drug) use and hearing loss in women. 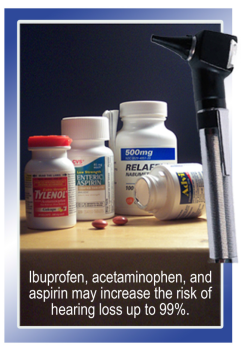 Multi-variate-adjusted relative risk analysis demonstrates that regular ibuprofen or acetaminophen use increases the risk of hearing loss in women by 8% to 24% as the usage rates range from two doses per week to six or more doses per week. These results add to those of a previous study demonstrating that men regularly using ibuprofen, acetaminophen, or aspirin increase their risk of hearing loss up to 99%. Regular NSAID use appears to have a greater effect on the hearing of men than of women, but both men and women are at increased risk. This latest study adds to an ever growing body of evidence demonstrating that routine acetaminophen or NSAID use even when over the counter is not without risk. Regular use of NSAIDs is connected with some positive outcomes in specific disease situations, but has also been connected with negative outcomes such as increased risk of renal cell cancer, acceleration of articular cartilage degeneration, gastrointestinal complications, etc. When patients report to you that they are routinely self-medicating with over-the-counter (OTC) analgesics for chronic or recurring pain conditions. In the American Journal of Epidemiology study, for each type of analgesic (aspirin, ibuprofen, or acetaminophen) 8 to 9% of participants reported usage rates of four or more times per week. The problem of chronic pain seemed to be fairly common. Among the most frequent reasons for regular OTC analgesic use were headache, muscle/joint pain, and backache. A digital age calls for digital solutions. Apollo Practice Management was created in 2007 to help provide solo practitioners and larger health organizations with a cost effective Cloud application for professional physical therapy management.